As a full-time content creator, it can be easy to lose track of time and work around the clock… into the wee hours of the night. With that said, unfortunately, I don’t always get my 8 hours of recommended sleep. Genetically, my eye bags are already bad as they are even with ample rest, so you can imagine how I look when I don’t get enough sleep. Practically like a goblin, ha! It’s a running competition between me and my black-faced pug, everyday. Can you relate? I have teamed up with Clarins to introduce to you their multi-active eye gel which has worked wonders for me. Using this product every morning and night has helped my 5 hours of restless sleep look like 12 hours of blissful rest! If you can’t feel the part, you should at least look it, right? Between shooting photos, creating content, and meeting with clients, looking my best is crucial. It makes me feel confident and boosts my productivity. But let’s face it – these hectic days and late nights can sometimes get the best of us. I don’t know about you, but my eyes often look puffy and dull from stress and lack of sleep. Lately, I have been using Clarins’ multi-active eye gel to cheat my way out of looking tired. The multi-active eye gel is an instant eye reviver that works to target fine lines. The formula is designed to keep eyes looking brighter and fresher by minimizing signs of fatigue, including puffiness and dark circles. The application is very simple and feels extremely soothing. One side is used to apply the gel on your eye contours, while the other is an ultra-cold cryo-metallic application tip. This tip enhances drainage so that eyes instantly appear more youthful. I use this once in the morning right after washing my face. On days I’m wearing make-up, I proceed with my regular routine. At night, I use it again after my shower right before bed. I’m really trying to get in the habit of sleeping earlier… but when work calls, it’s good to know that Clarins has my back! 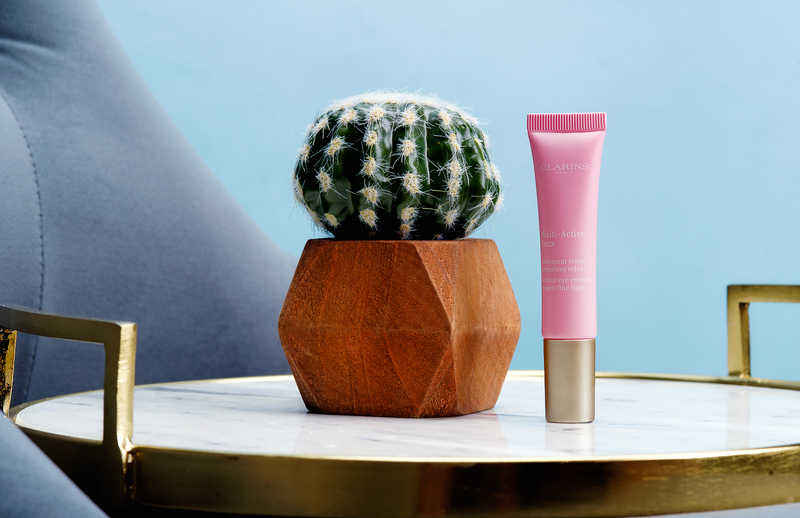 Have you tried the multi-active eye gel? What are some products you swear by to keep you looking fresh & awake? Fatigue, puffiness and dark circles..I have them all! I should try this. Great pics by the way. I love Claris products but haven’t tried the or multi active eye gel. I think we often neglect our eye area when it comes to taking care of our skin so I’ll make an effort to check this product out as it seems very beneficial! Wow that product sounds amazing! You don’t look tired at all! I’ll definitely have to give it a look. Thanks for sharing! This looks super awesome! Love a good eye cream! I don’t get the 8 hours either, sometimes lately it was more like 3. Awful! Seriously should give this a try, sounds good. You look amazing in these shots! Flawless! I need to try this eye gel out, I’ve been looking for an effective eye treatment for sometime and this looks amazing! Thanks for stopping by Hay! this isn’t the first time i’ve heard about this product, and every time, its rave reviews! i want to try it so badly to help with my dark circles! I hear you. As everyone else is celebrating Easter in one way or another, I was up until 4 am last night working. I hear you when it comes to battling those bags under my eyes and they for certain aren’t Chanel… Looking fresh despite lack of sleep is a key in our business and as I haven’t tried this gel from Clarins yet, I most certainly have to! I’m going to have to try these products! I love your photos, it looks so prefessional! I KNOW my eyes always look tired. Between my crochet business, blog and three kids, I barely have time to sit and just relax. I need to look into this!! I am an early riser so I try to go to bed early but don’t always get to because of my schedule. I will definitely try Clarins eye gel because those bags always seem to puff up on you. Great post. I’m the same way! Been getting up a lot earlier but not necessarily sleeping earlier… which is the problem lol. This has definitely helped my eyes de-puff though! Clarins has some amazing products! You can see how much these work and I’m sure it has amazing results! First of all I LOVE your pictures, so much they are so beautiful. Clairns does have amazing products and this is such a great one, gonna have to check it out. I def need to work this into my routine, as someone who wakes up early and often goes to sleep late bags under my eyes. I do too! Thanks babe! This is truly a must try and a great product to be in your essentials! Many have been suffering from sagging eye bags so this is just a perfect one for them too! Thanks for sharing this babe! Always looking for a good pick me up for my eyes. My eyes are always puffy and achy with fatigue. Your eyes are flawless already girl! Wow, Geat review! I love the all the picture ( sharpness, details skin tone etc) Very nice blog to follow. I’ve never tried this eye gel, but it looks and sounds like a beauty product I need. I often find myself not getting enough sleep due to blogging and also working full-time and this looks like the perfect thing to use! Wow girl! You blog and work full-time?! That’s amazing! Don’t know how you do it haha. I blog full-time and already need more hours in a day… haha. Awesome pics, of course! I think I need to try this stuff. My eyes have been looking dull lately from poor quality sleep (due to autoimmune symptoms). I need something that actually works! I know that feeling girl! Haha thank you so much! OOh I think I need this! Your skin looks flawless! I love Clarins products! I need to try this product! I have all the problems under the sun with my eye area. Maybe I should give this product a try! It’s working pretty well for me so I am hoping it will for you too! I have literally been on the search for something great to help with under eye circles! I’ve tired so many ting! Gonna try this next! I love their products! However, I haven’t try this product yet! Thanks for sharing! Can’t wait to give it a try! Yes! You’ll have to let me know how you like it! Love the sound of this! I’m always trying to get rid of dark circles! You should definitely give this a try. It hasn’t gotten rid of my dark circles 100% but has definitely improved it! This post is right on time. Ive been looking for something to help with my under eyes. I have not seen this brand yet. Im definitely going to try it. Let me know how you like it babe! I definitely need to give this eye gel a try! I’m a total night owl and often work well into the wee hours. The older I get, the less I can get away with it haha! This sounds like just the antidote! I definitely need to try this since my eyes get super tired by the end of the day! Love these gorgeous photos, great post! Thanks Chelsea! If you do give it a try I would love to hear your thoughts. ohhh! I use a couple different Clarins products, but I’ve never used this one! I’ll have to give it a try. Thanks for the honest review! I’ve been in search of a great eye gel, and this just might be it! Thanks for sharing; definitely worth a try. You look gorgeous and I have to try this product! Looks amazing, especially for summer! If you recommend it then I’m going to buy it! Your skin is flawless and you’re so stunning!! Aww thank you Cindy! You’ll have to let me know how you like it! i LOVE a good eye cream! with this dry denver weather, i need a good one! Thanks for the rec! I can totally agree with you that blogging can take a toll on your face. The late nights and running to meetings will show on your skin so fast. But to see you talk about this product so highly and that it can be a great aid in those rough and busy days of ours is so good to know. Thank you for sharing this. Gonna have to add it to my routine now! I’m so glad someone out there understands! Haha! I love what I do but there is definitely stress that goes with it too. This eye gel has definitely helped improve my skin condition around my eyes though.. especially on days I lack sleep. Thanks for stopping by! I am always looking for new skincare products to try. This one is right up my alley. I need to add this to my routine. I need to try this, I have horrible dark circles! Thanks for sharing babe! OMG your pictures are simply….. AMAZING!!!! This sounds amazing! I need to try this for my next eye cream. Amazing pictures as always and I love that your posts are always so deeply informative. I have not tried this eye gel from Clarins but I did hear a lot of positive feedbacks on it. I also rely on eye gels to help me relieve puffiness and somehow hide my fatigue. I currently use one from Fresh and I love it! I’ll definitely need to try this! I always have horrible bags under my eyes no matter how much I sleep (it’s so bad) so maybe this would help. I think this would help! Genetically I have bad eye bags even with plenty of sleep… this doesn’t 100% get rid of it but definitely helps me look more awake and less dull. I definitely need to give this a try. My eyes can definitely get puffy or have some fine lines when I’m not getting enough rest. You look so flawless, Love the photos! I am with you babe! Well, I definitely recommend giving this product a try. Thanks for stopping by! Love a good cure for those puffy eye bags! This sounds amazing, I need to try it! It’s amazing — I’m hooked! Dullness is definitely a major problem for me at times! It’s so hard to look fresh when you are lacking sleep. Your skin is so flawless Sharon!! I need to try this! You always look great babe! But yes, this is a lifesaver for dull eyes! I need this! I never seem to e able to get enough sleep! Clarins is such a great brand, my Mum has been using it since before I can even remember! I think I first learned about it through my mom too and have fallen in love with Clarins since! Wow these images are gorgeous! We don’t get the recommended 8 hours of sleep usually either, we will have to check this out cause our bags under our eyes can be so bad! If this makes me look anything like you, then I am in. I know that feeling girl! Haha I’ve been trying to adjust my sleep schedule and in the mean time this product is saving me! Sounds like a miracle, I’ve been searching for something to help with my puffiness so I’ll try this! Yay! Hopefully you’ll love it as much as I do! I LOVE this product so much! The concept behind your post is incredible!